Gauge employee satisfaction level, assess E-learning, Create fun and competitive environment between different teams and regions and motivate employees with quiz module in Creative Social Intranet. Digital Quiz competitions in your intranet enable employees to think from different angles or simply ‘to think out of the box’. Quiz games are like mind sports wherein the players, either as individuals or in teams attempt to answer questions posed to them correctly, for winning the competition. When the whole world is going digital, digital quizzes can be used to motivate people to "want to" learn. Companies can post e-learning courses in their intranet with a pre-test. Such pre-tests results can be used for the expressed purpose of allowing learners to see what they already know and don't know. When employees don't find an answer for a question in the quiz, they will more likely be motivated to pay attention to that topic in the course when it comes up, so they do not miss that question again. Use pre-tests to help your employees see what is coming so they can prepare themselves to pay attention during the course. 2. Quizzes help employees remember courses learned. It is always a good idea to revise what was learned during the e-learning course. Revision is a significant element of learning. Quizzes help one remember and revise elements learned. Quizzes can be picture quiz by escalating day to day process and problems involved in doing, thus helping employees gain enough practical knowledge. Quizzes can also be related to health awareness or security social awareness for engaging employees and making them alert and proactive to face such situations. Of course, we want to know whether people learned something, and most of you will want to track and report that people learned something. So at the end of the e-learning course, you can present a standard quiz using multiple choice and true/false questions in your intranet. At this point, grading the quiz is appropriate and learners should be told that the final quiz will be graded and posted on the intranet. You can even announce prizes or rewards for the winners of the quiz in your intranet. Employees typically forget 80% of new information within 30 days - unless it is reinforced. 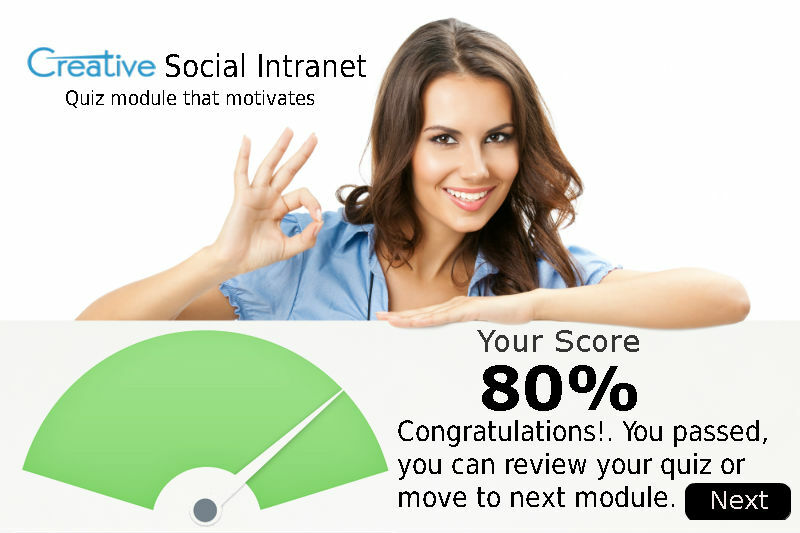 Creative Social Intranet Quiz modules offer an effective way to reinforce such learning in an engaging way. A targeted quiz showcased in intranet dashboard with a popup can be used for many purposes, from gauging an individual's capability, satisfaction level, testing their knowledge post-training or sourcing feedback on projects. For acceptance and ethical training, scenario-style quizzes can help employees preempt situations at work and consider adjudge their actions in a speculative way. Full reporting allows you to see which employees have completed the quiz and to compare their results. Provide further training for the under-performers. Receive auto reminders for uncompleted quizzes. Reminder notifications on the screen of an employee who has not yet participated. Allow multiple attempts from employees to motivate them to improve their scores and go to the next level. Allow confidential (and anonymous) responses for pre-tests before applying for grades. Multiple choices for a particular question.